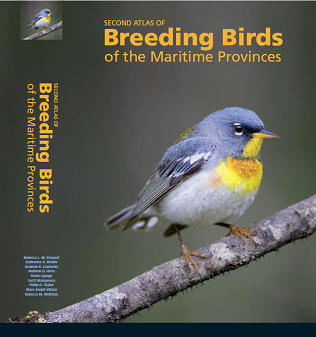 Due to overwhelming interest, there are currently no copies left of the Second Atlas of Breeding Birds of the Maritime Provinces for online sales. However, if there is sufficient interest, we will consider a second print run. Please be aware that the price may be somewhat higher. If you may be interested in ordering from a second print, please email us your name, address, email, phone mba-aom@birdscanada.org. The Second Atlas of Breeding Birds of the Maritime Provinces describes the distribution and abundance of 222 bird species that nest in New Brunswick, Nova Scotia, and Prince Edward Island. This atlas is one of the largest wildlife monitoring projects ever undertaken in the region. About 1300 volunteers contributed over 48,000 hours of survey effort! The beautifully-illustrated book includes 350 full-colour photographs, 800 vibrant maps, and informative species narratives. We only have a limited print run available. Don't miss your chance to own this important book. If you ordered your book(s) during the presale and requested to pick up your copies in person, please note that launch events will occur between May 7-19, 2016 in various locations, which are now posted on the home page. A small number of additional copies of the book will also be available for sale ($72) at the launch events (subject to availability). Please send my book(s) by mail (in Canada). Cost per book: $97. All books will be shipped to your address, unless you provide us with instructions in the comments box on the next page. I live in the United States (shipping costs: CA$40). Cost per book: $112. Please contact us for shipping outside Canada and the United States.